Building a brand that resonates with consumers on a high level is no small task and is only becoming increasingly difficult. Despite having the benefit of learning from past successes and failures, the world we live in now has never been more fast paced, connected and over-saturated with companies claiming to be the next Apple, Nike or Google. Many of these brands, however, fail to create value and establish the necessary presence they need to attract and retain loyal customers. So how do you navigate this ever -volving landscape? Branding Magazine claims there are three essential P’s you must focus on to create and maintain a successful brand. In order to understand what exactly will resonate with your consumers, you not only need to have a fundamental understanding of people as a whole, but you need to understand your target audience on a comprehensive level. What drives them? What makes them tick? Conducting research and gathering data is quintessential to the branding process as this data will allow you to not only better reach your target audience, but also allows you to personalize consumer experiences. Take Facebook, Amazon, Netflix or Google, for example; these leading brands have taken personalization to a whole new level using people’s personal preferences to make the consumer experience much more intimate. Returning to the question of what drives people, we know many are looking for a sense of purpose in life, something that gives their lives meaning and direction. Consumers look for the same thing in a brand. They want a brand with a clear purpose and one that is invested in an important cause. Your brand needs to go beyond the simple purpose of making a profit and creating wealth. In order to retain consumers, your brand should be socially, environmentally, and economically conscious. It needs to clearly define the higher social purpose it serves and make sure it’s an authentic, credible and proven part of its brand story. It is the emotional tie people can identify with. Once you understand your consumers and define a clear purpose, you must get people to experience and participate with your brand. People are no longer satisfied with only being on the receiving end of a brand’s cause — they want to influence it, be influenced BY it and make it their own. Participation is ultimate and most effective way to interact with people. The relationship a brand builds with people needs to be less transaction-focused and more interaction-based. 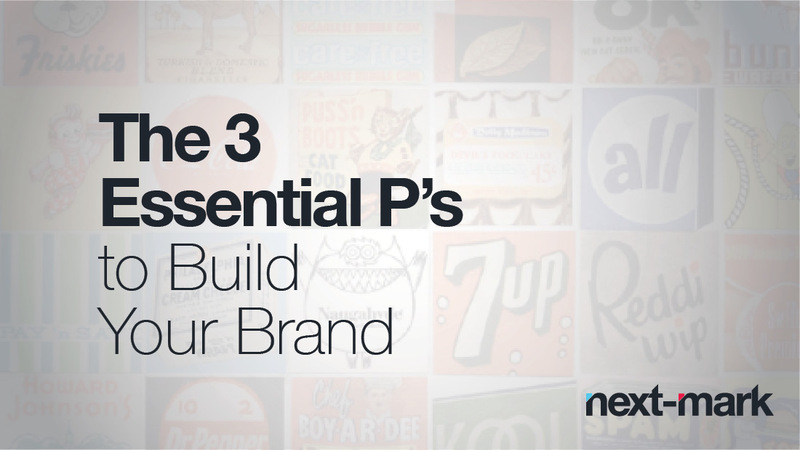 And there you have it, the three P’s of branding. Brands must focus on these concepts in order to stay relevant in this crazy world we live in. Here a Next-Mark we believe a brand is everything, and know having a clear defined brand message is vital for your organization’s survival. If you we can assist you in any way please feel free to give us a call at 941.893.3140. Wait, was that an ad?